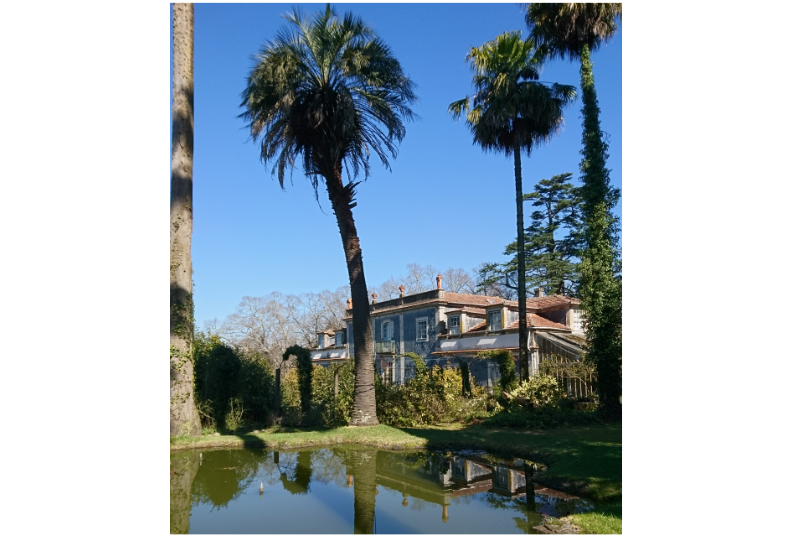 High days and holidays in Calheiros. Until the fireworks disturbed the peace, echoing around the hillsides, I hadn't thought of a particular name in decades. A distant cousin of mine in Whitehaven, whom I met only once when I was eight or nine and she was a teenager, was christened it as was my English teacher at secondary school. We called them both Effie, one to her face and one behind her back. (You were deferential towards your teachers in those days and her proper name was Miss Sinton.) Other than those two cases I've never again come across the name.... till now, in Calheiros. To find out what the name was, where I found it and what happened next, click here. The detonations, accompanied by puffs of smoke rising into the still air, which reverberated around the hills of Calheiros, signalled the beginning of our local village's saint's day. 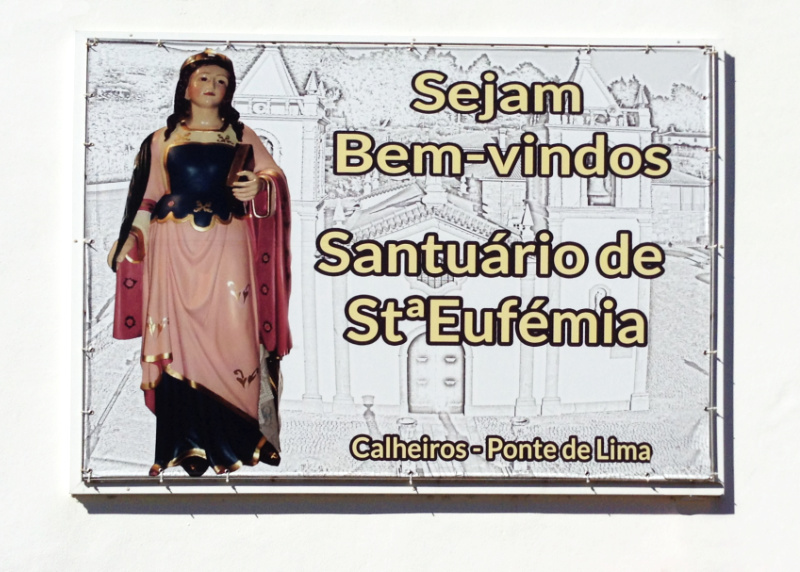 She is called Santa Eufémia – spelled Euphemia in my cousin's and teacher's cases – and here she is welcoming all comers to her church. 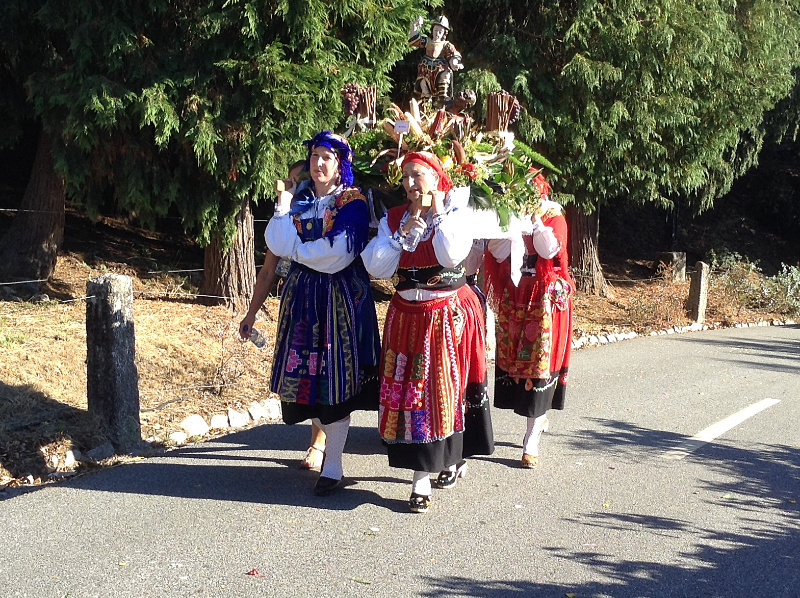 The fireworks were succeeded by music filling the valley; folk songs, fado, and accordion pieces. 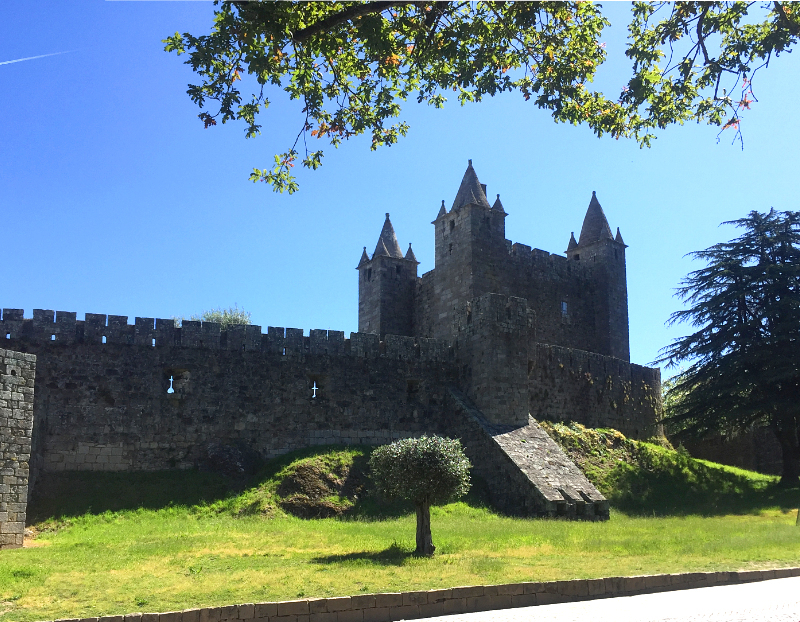 We hadn't been in Calheiros for the festa before so we put on our walking shoes and headed down the road towards the village to see what was happening, almost immediately regretting that we hadn't brought a bottle of water with us because it was so hot. We were far too early. The music functioned rather like the peal of bells on Sunday in my village on the edge of in York. It was only alerting the people to the upcoming festival not actually part of the action, so we decided to explore a little. 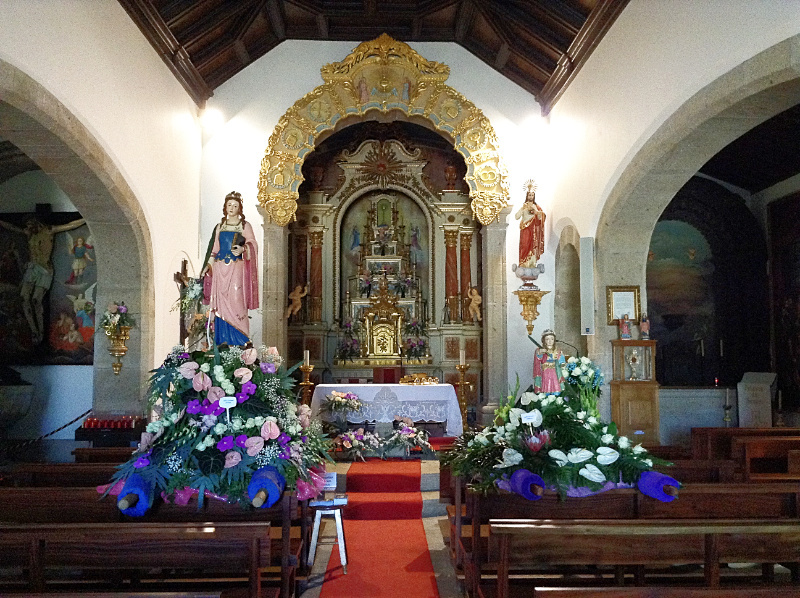 All down the shady side of the church were banners leaning against the walls by platforms of flowers, exquisitely arranged – for my Portuguese readers this is English exquisite, meaning extraordinarily beautiful and not 'esquisito' in Portuguese which means peculiar or strange – around a centrally placed plaster saint. 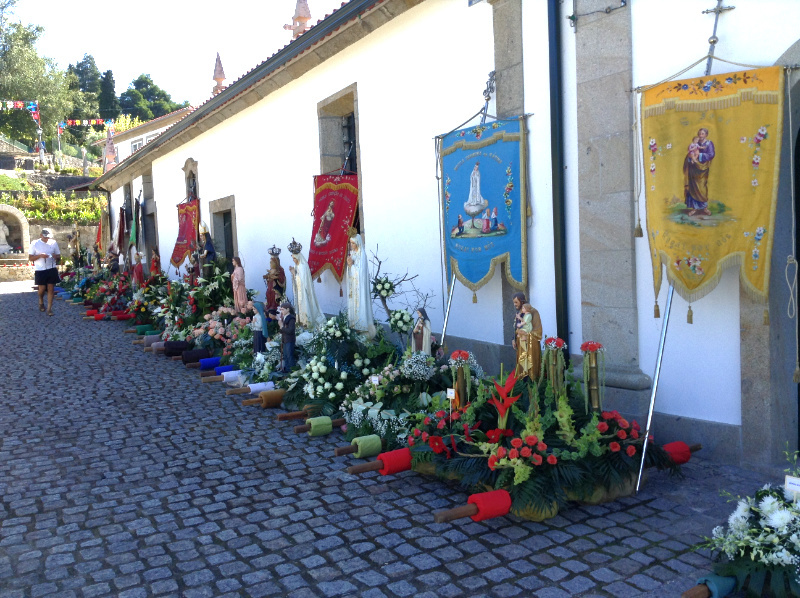 The time, effort, skill and expense put into these arrangements are testament to the still deep faith and respect for tradition that exists here in the Minho. 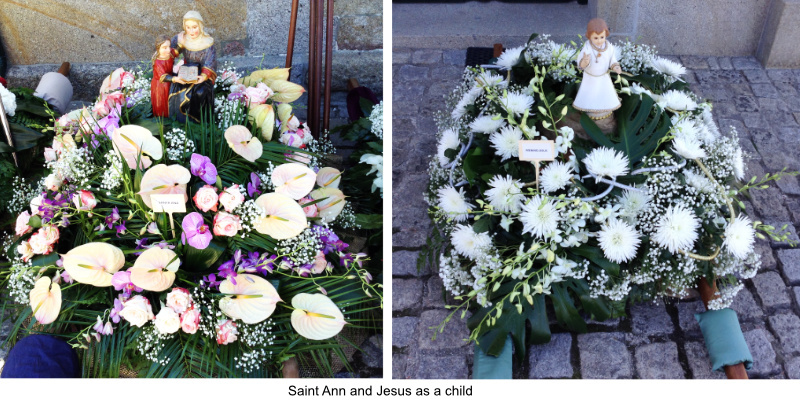 We peeped into the church and saw a large statue of our saint waiting to be blessed and taken out into the streets for all to see, together with a smaller version of her as a child. Outside again, we settled down in the porch of the church meeting house to watch and wait. Families and individuals began to drift by. Some went into the church; others went to buy festive buns and biscuits at a nearby stall. Groups of bandsmen and women in uniform, many of them young, turned up carrying brass instruments or drums. 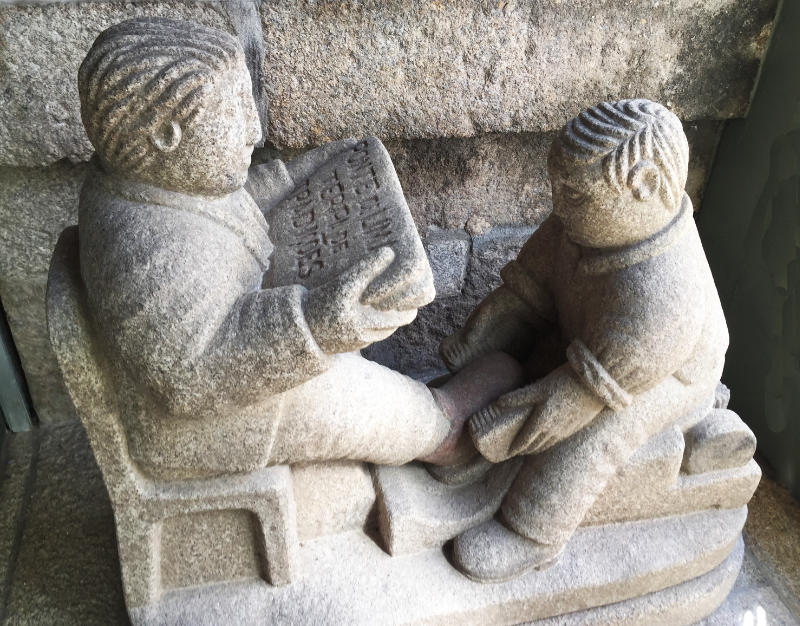 They squatted by the walls in the shade. Clearly sooner or later there was going to be a parade. 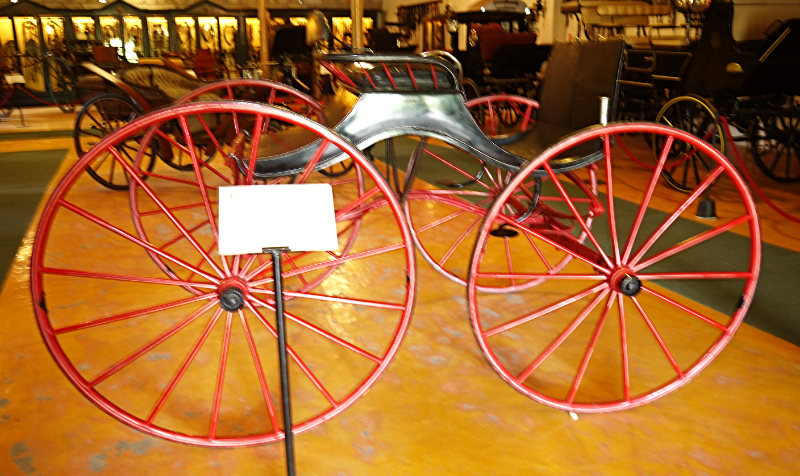 Around 3.30 things became a little quieter and more serious – though not very much since religion here is so much part of the fabric of life that it doesn't get noticeably special treatment. People don't feel the need to speak in hushed tones as they often do in England; after all, God is everywhere all the time, not just in church for matins on Sunday morning. After what seemed an inordinate wait, things began to get under way. There were a few announcements: the water in the fountain behind the church had been tested by the authorities the previous day and pronounced perfectly clean. This was welcome news for those of us, who like the foolish virgins in the parable, had arrived unprepared! Then there were notices of other feast days coming up and various parish matters. The church was packed to the rafters and those unable to get in crowded around the door. At last the solemnities began with hymns, sermon and communion. Those of us left outside did not miss out, though, as everything was relayed on a loud speaker. I have to say that I thought the sermon over-long but supposed that the vicar and his august guests, local dignitaries and bishops, thought that the huge captive audience should definitely be given good value – or perhaps it was that it might be another year before they'd have the opportunity to hear so much of their own voices again! It was also clear that giving the eucharist to such a large congregation was going to be a long process. To pass the time, the members of the various bands exchanged banter. One participant avoided boredom by going to sleep stretched out on a stone bench while a group of teenage girls played a game that looked like a version of scissors, paper stone. Finally, the vicar in a white surplice and red sash, several bishops in their gold mitres, choir boys and girls and those designated the bearers of the saints and their flowers, came out of church and began to line up. This where the vagaries of language strike you. I have previously been corrected when using the word procissão at a secular event. 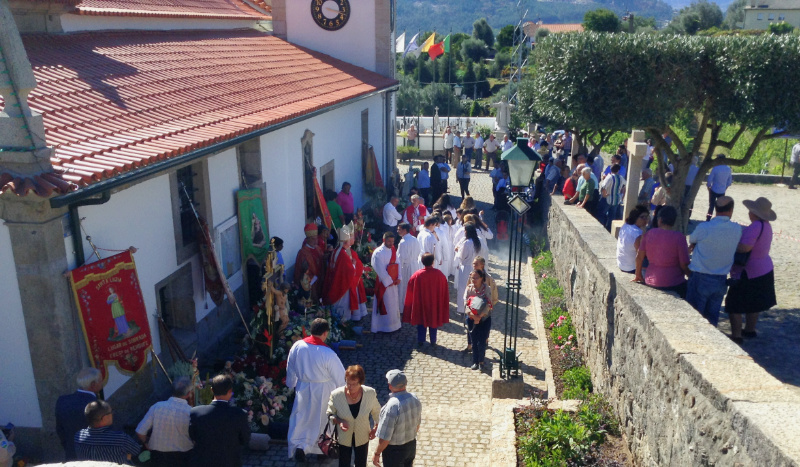 A procession in Portuguese is a religious affair. 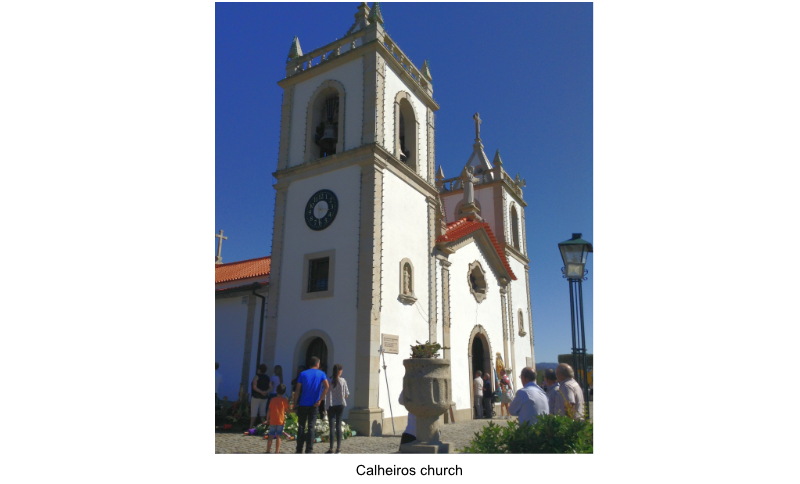 The word I should have used then was cortejo, which to me, in English, is funereal but in Portugal is a fun activity with floats depicting local history or products, singing, dancing and general excitement. 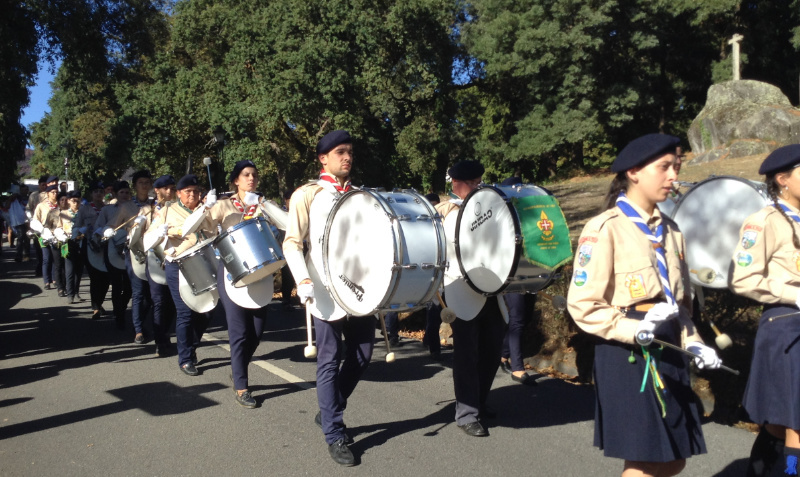 So over to you now, you choose the word that suits you in your language when I tell you that the drummers beat out a slow march and the players and the statue bearers all paced slowly and solemnly down towards a chapel at the corner of the road. In Portugal at events like these, everyone is involved from young adults in jeans and flip flops to the mature, even quite old, in national dress. 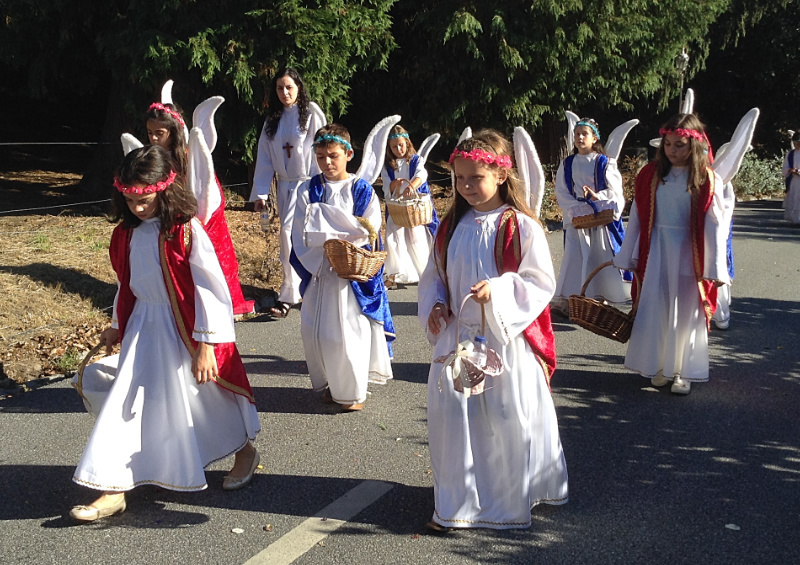 And for the little ones there is the thrill of dressing up as angels. 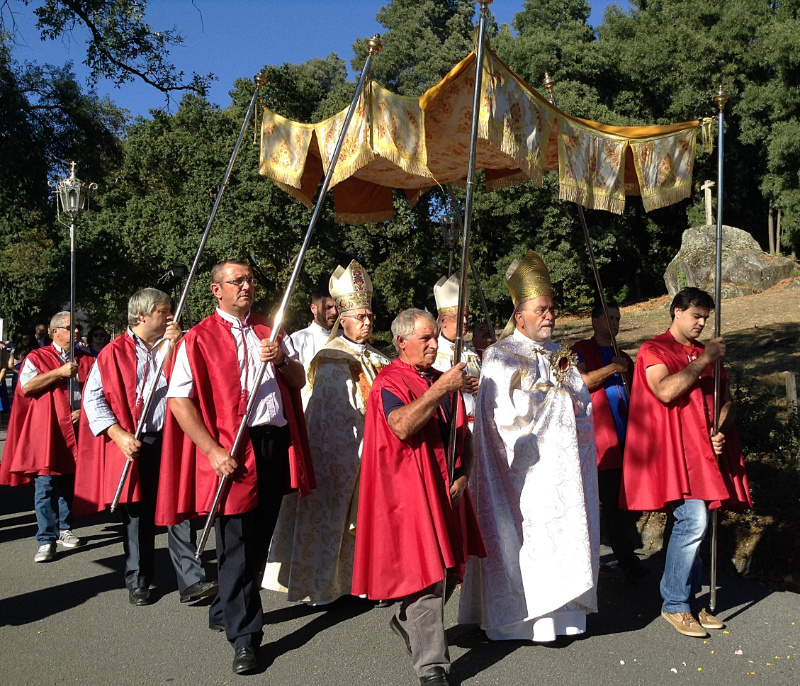 The dignitaries too, in all their pomp, some carrying relics and crucifixes, walked the circuit to show everyone the statue of our saint and other saints from surrounding villages. 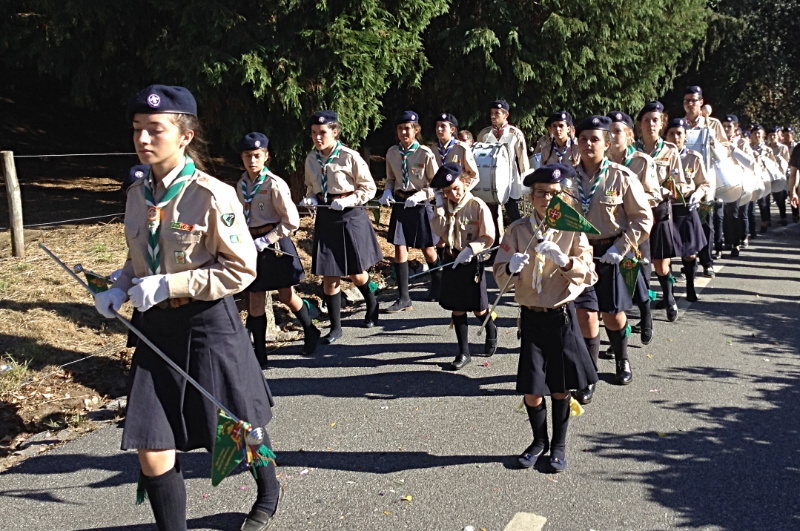 Most impressive of all to me, though, is the participation of adolescents. 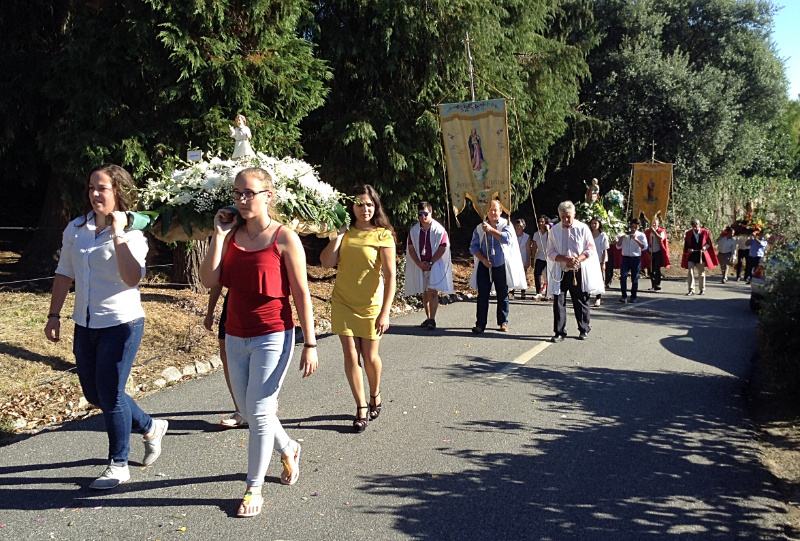 The young folk gave up their weekend to play and sing hymns at their local festa and indeed those of other churches as the bands came from all around. They sat patiently through the long service, almost an hour and a half of sermon and communion. There was no complaint and it seemed as if the waiting in the heat, the endurance of boredom and the playing of the tunes wasn't a duty, it was a pleasure; it was what people did naturally in a close-knit community. I find it hard to believe that equivalent youths in England would be so good-naturedly co-operative. I doubt too that anywhere near as many are able to play instruments of any sort whereas in Portugal it is commonplace for children to read and play traditional music. The fireworks were let off again late into the night, waking me periodically when I thought it was all over. I was not so impressed by that! A palavra procissão é boa e seguramente certa e quanto ao termo cortejo ainda temos que falar e aprofundar mais depois de uma conversa que já tivemos sobre isso e o seu significado ... o paganismos associado é interessante. Para rever ou não logo se vê e atenção a ortografia da palavra que deves emendar - cortejo. Se tiver tempo ainda vamos ter contigo ao Douro brevemente. A coisa idiota e que devia saber soletrar esta palavra desde que tive de verificá-la antes. Devo estar a tornar-me disléxica na minha idade avançada! Great! 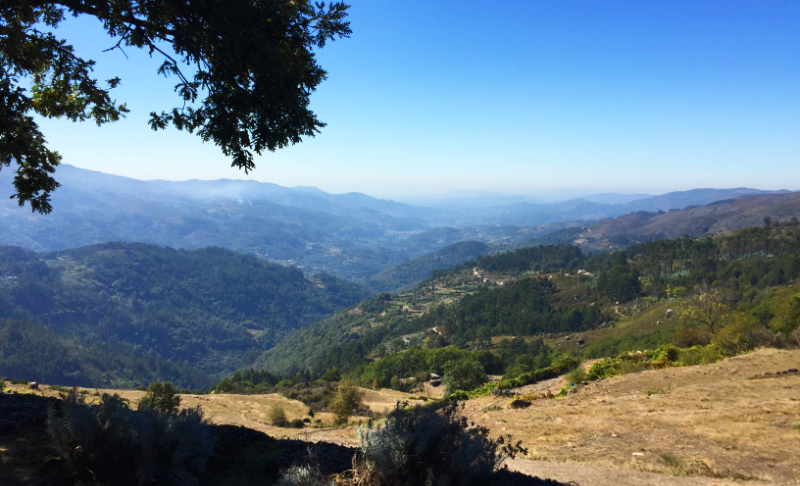 Very nice piece of writing and depth information on High days and holidays in Calheiros. After reading about the fireworks which is filling by music I am very excited to visit this place and would love to enjoy traditional music. Thanks a lot for sharing it here and I will be happy recommend this useful website to my feel team members and academic tutors at Quality Assignment UK.